Over 17 million people around the world are forced to flee their homes by conflict or persecution each year. After enduring the long and treacherous passage to safety, many refugees arrive at settlement camps suffering from malnutrition and dehydration and require medical attention on site. Claire Traweek, Sam Kim, Jessy Lin, Neil Gohklay, and Juliet Wanyiri pose with two of their mentors after winning second place in the migrants and refugees category as part of the Vatican's first-ever hackathon. Photo courtesy of the MIT Innovation Initiative. Most ailments are easily treatable if properly diagnosed, but communicating across languages and cultures can be difficult. Patients often struggle to convey their symptoms, and doctors worry they may be missing crucial information. To complicate matters, doctors jot patients’ medical notes on paper, which can result in incomplete and illegible information being recorded. Further, each time a refugee moves to another camp, a new record has to be started for the individual, making it hard to maintain a consistent medical history over time. There’s no shortage of apps designed to address the current refugee crisis. Rather than impose an entirely new system or technology, a team of MIT undergraduate, graduate, and PhD students from multiple disciplines set out to develop a solution that recognizes and supports existing workflows that also helps overcome time, language, and cultural barriers in doctor-patient interactions to improve overall medical care for refugees. Sajal (meaning “record” in Arabic) is a lightweight electronic medical record that refugees can carry around with them on their journey. Patients begin by completing a one-time registration form with their name, date of birth, country of origin, nationality and languages spoken, along with a few simple metrics like height, weight and blood type. A QR code is then generated for patients to carry between camps and countries and keep for the long term on their phones, a prized possession and lifeline for most refugees. To access a patient’s information, doctors simply need a QR code reader to view the individual’s medical history online. In addition, they can record notes by text or voice directly onto the patient’s page. The platform will then automatically transcribe and translate the notes, which are also searchable across languages using IBM’s speech-to-text API. This way, doctors are able to see if someone has had a history of problems in a specific area and can do so without worrying about miscommunication with the patient. 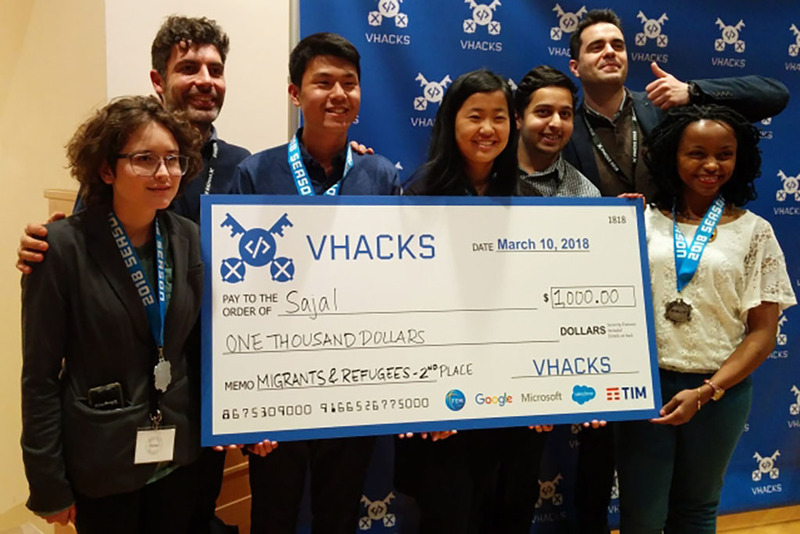 The idea for Sajal came about as part of VHacks, the first-ever hackathon held at the Vatican City in Rome on the weekend of March 8-11. Student organizers from Harvard University and MIT worked with the Vatican’s Secretariat for Communications and OPTIC — a global think tank dedicated to ethical issues of disruptive technologies — to coordinate the historic event. Organizers invited universities to provide teams, and an open application allowed any student enrolled in an undergraduate or graduate program to apply. The MIT Innovation Initiative —a cross-school effort to strengthen and promote innovation and entrepreneurship — put out a local call for applicants to bring this unique opportunity to MIT students. After reviewing applications and conducting interviews, the five students that best demonstrated real interest, commitment, and the ability to creatively problem-solve, were selected for the team. The Innovation Initiative, with additional support from the MIT Sloan School of Management and Office of International Programs, covered travel and incidentals for the students while accommodations and meals during the event were provided by VHacks. Over the course of the 36-hour challenge, 120 students representing 30 countries and six universities came up with a total of 24 ideas that leveraged technology to address current global problems centered on the hackathon’s theme areas of social inclusion, interfaith dialogue, and migrants and refugees. “We intentionally spent more time than the average team to ideate and conduct primary market research in order to ensure that the solution we built was actually solving an important problem and not just one we made up on the spot,” says Neil Gokhlay, an MBA candidate at MIT Sloan School. Their idea came together when they were able to connect directly with a doctor based in Rome who volunteers her time at refugee camps through one of their mentors. “We interviewed the doctor in order to understand her pain points, and after coming up with a solution, we ran our idea by her to make sure we were really addressing the problems. It was through this process that we realized there were communication issues and a lack of health record management for refugees in these camps,” Gokhlay says. After the hacking period came to an end, the students presented their concept to a panel of judges before being selected to move onto the final round in which nine teams pitched their projects in front a live audience. Teams were evaluated based on the viability of their project, the potential impact that project can have, and the technology used to build the project. At the end of the day, prizes were awarded in each of the three theme areas, with Sajal winning second place and $1,000 in the category of migrants and refugees. Fueled by the experience of coming together as a team and building something they think can have a real impact on those who need it most, Gokhlay, Lin, and Traweek — along with teammate Juliet Wanyiri, a graduate student in integrated design and management — all agree Sajal is an effort worth continuing. The team is especially proud they were able to take a human-centered approach to tackling the problems faced by migrants and refugees and that by putting people’s needs at the center, instead of the technology, they were able to come up with a solution that has immediate value to individuals. According to the students, the refugee doctor that helped them design their initial prototype is already on board and excited to pilot Sajal with her patients. They hope to expand their user base to additional doctors at the same site before launching the platform at other refugee camps within Italy. Eventually, their goal is to release Sajal worldwide. In the meantime, as hackathon code is notoriously messy, the students are in the midst of polishing the technology and will be adding a number of features they didn’t have time for earlier, including machine learning for diagnostic assistance, privacy and authentication measures to protect patient data, and SMS registration. To support their work on Sajal for the long term, the team has already applied to a couple of seed grants and is actively looking around for other resources across MIT’s innovation and entrepreneurship landscape.